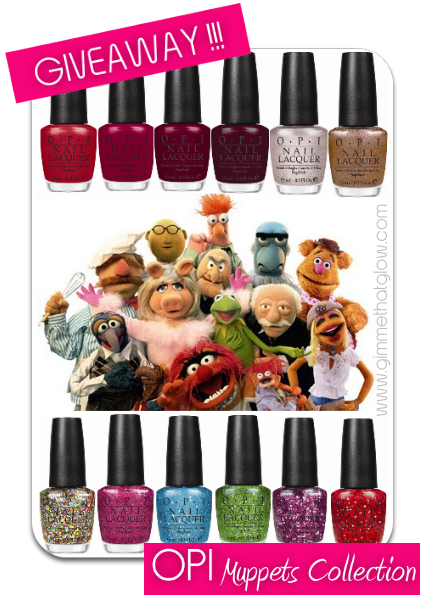 GIVEAWAY | Win The Entire Disney "Muppets" Collection by OPI !! Hey everyone! It's been awhile since our last giveaway and in honor of the holiday season that is quickly approaching I decided what better way to kick off the season than with an exciting gift? As some of you may know, OPI has recently teamed up with Disney in collaboration with the new Muppets movie and has launched The Muppets Collection. The nail collection consists of 12 limited-edition nail lacquers for Holiday 2011. Here's your chance to win the ENTIRE collection! Use the widget below for instructions and to enter. Good Luck! My favorite Muppet is Miss Piggy, of course! She is such a diva! I love Statler and Waldorf. The Muppets wouldn't be the same without them. Miss Piggy and Kermit will always be my favorites! My favorite Muppet is Kermit because he's a good friend, has a good heart and he sang the alphabet with Ladysmith Black Mambazo on Sesame Street. My favorite muppet is and will always be Ms. Piggy. I love how she is so persistent in getting Kermit lol. I saw the OPI colors in the store the other day, and all of them are fabulous. My favorite muppet is Gonzo! My favorite is Miss Piggy! Shes pink and glamorous! loving the colors and the glitters! Those colors look so fun!